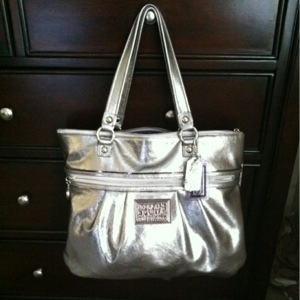 Coach Poppy Metallic Tote Gift! 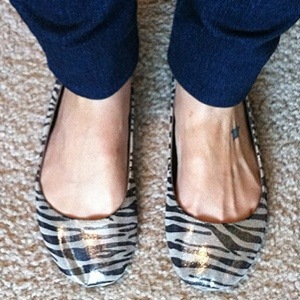 I love these metallic zebra flats. They add a touch of whimsy and lots of sparkle to any outfit! 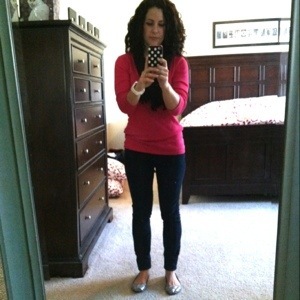 The $9 skinny jeans from Forever 21 are the only item I wore today that I paid full price for. Many people are too impatient to wait for sales or to take the time to look through racks of clothes. When you pay full price, you are often paying for the convenience of being able to go up to a display and easily find your size. I think of shopping as a challenge and I actually enjoy digging through racks and bins looking for the size, style, and color I want. I love the shoes and pretty pink shirt. Did you get the pink shirt from The Gap or Gap Outlet? Ooops! Sorry I wrote 2 responses. When I signed in and wrote a response it showed that the comment didn’t appear on your blog. :) I want the shirt but we only have a Gap Outlet. No worries :-) I have found very similar shirts at the Gap Outlet that are long sleeve and 3/4 sleeve. I bet they are clearanced now, since the spring and summer lines are out! The website works like this: each week I announce a new fashion trend, and people then tag themselves on Facebook wearing that trend. This is done by tagging their picture with the Tag a Trend Facebook page. The other option is to directly add your pics to the facebook wall at http://www.facebook.com/TagATrend or to email pics to kte20@hotmail.com. The best pics then appear on my site. This week’s trend is ‘Safari Style’ and as I can see you are loving the trend, I thought you might be interested in getting involved and tagging yourself in something Safari! Thank you so much! Your comment was in my spam folder. I will be sure to check out our FB page.